Kyle Willoughby and Claire White are here to talk about the superhero with all the powers of both squirrel and girl! 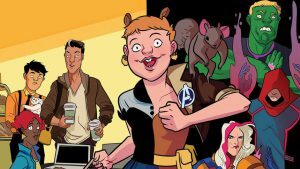 Marvel’s comic series, The Unbeatable Squirrel Girl is a surprise bestseller about a superhero that’s got two buckteeth, prefers talking to fighting, and once secretly lived in The Avenger’s attic. Claire relates Doreen Green’s humble woodland beginnings and satirical adventures. Kyle discusses the creative goals of Ryan North and Erica Henderson and how they managed to make a comic for people who don’t usually read them. Our hosts conclude with their thoughts on what makes Squirrel Girl so refreshing.